Explore, Learn, Have Fun! 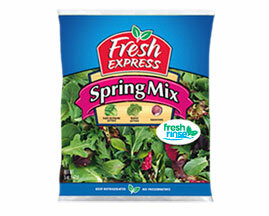 : Get a free bag of Fresh Express Salad washed in Fresh Rinse! Get a free bag of Fresh Express Salad washed in Fresh Rinse! I love Vocalpoint ~ they let me try new products first, give me the chance to share my opinions about them, and they send me coupons to share with my friends too! I wanted to let my readers know about their latest offer! Click here to request your free sample of Fresh Express Salad washed in Fresh Rinse, so you can try it for yourself! What is Fresh Rinse, you ask? Well, here's what Vocalpoint had to say ~ Fresh Express® has developed a breakthrough, eco-friendly produce wash called Fresh Rinse™ that is 7x more effective in cleaning salads than traditional chlorine wash, but is still gentle on lettuce. It's also acceptable for use on organic products! So basically, this is a bagged salad that is ready to serve - no washing required! Click the link and snag a free bag of this yummy salad for yourself! !